A Lie of the Mind at the Southwark Playhouse. Sam Shepard’s unsettling American family dramas from the late 1970s and the 1980s, with their festering wounds and shedding limbs, have crawled across the London stage with an increased frequency of late. Last winter’s Buried Child at the Trafalgar Studios was a portrait of a crumbling family drawn through its land, with its failed Illinois farm, mysterious corn and, of course, the child of the title itself. A Lie of the Mind is also a family portrait, but this time of two unravelling families in the desolation of snowy Montana, where Shepard picks apart the archetype of the rugged American northwest and turns it into a jagged psychological landscape. 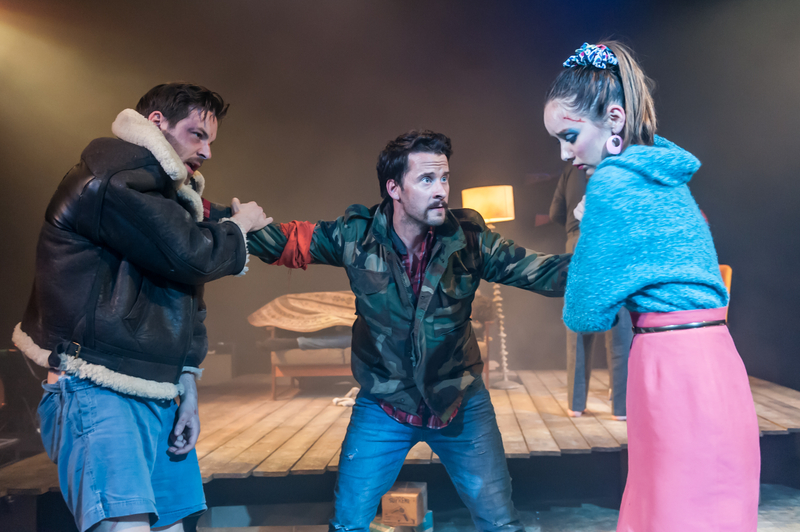 The play opens in the wake of a terrible act of domestic violence, an unspeakable and brutal act committed by Jake (Gethin Anthony) on his wife Beth (Alexandra Dowling) that has left her in hospital with severe brain damage and him on the run. Jake’s brother Frankie (Michael Fox) is his first confidante, who eventually decides to travel to Beth’s home to see if she has lived or died, while Jake grows increasingly unhinged, both physically and emotionally. Jake’s mother, Lorraine (Kate Fahy), insists that he must be kept at home to recover, and has no recollection of Beth, or him ever marrying Beth. Neither do Beth’s parents of Jake. Baylor and Meg (John Stahl and Nancy Crane, both astonishingly good) seem to have wiped the wedding from their memory, despite their son and Beth’s brother, Mike (Robert Lonsdale), insisting that they were there (or, at least, one of them was). More than thirty years later, Shepard’s 1985 text still glitters with despair and devastation. It’s an intricate, textured work that brings together themes both familiar and familial – a cocktail of masculinity and emasculation, parents and children trading places, sibling jealousies, simmering resentment, the end of the American Dream and the post-industrial economic slump of the 1970s. All of it contains echoes from his previous family dramas. You could say the same of the America of today, with its disenfranchised white working class. But A Lie of the Mind ratchets up the action when it comes to isolation, denial and selective amnesia, particularly regarding the things its characters are desperate to convince themselves of: the belief that a man can rely on himself and has no need of ‘females’ (while remaining completely reliant on the women of the family); the belief that the American flag is still a symbol of hope and aspiration; the belief that what is broken can forcibly be made whole. In Shepard’s America, everything is ever so slightly off-kilter, which has the effect of suffusing the entire play with an incredible unease. Memory and forgetfulness pervade the play. Characters forget key milestones in their lives, including weddings, illnesses and deaths. In a Pinteresque turn, they invert daytime and nighttime, groping through a sort of unending twilight. It’s a talky play full of emotional inarticulacy, of the things that families have forgotten how to communicate. Beth must learn how to speak again, putting half-remembered words and sentences together in a pidgin English that, ironically, makes her the most articulate character despite her lack of language and lack of memory – because while the other characters navigate social niceties and follow conversational circles of politeness and fear, she speaks simply and directly. Her damaged acuity for language may have imprisoned her in her mind, but the words she speaks have a startling clarity. “Look how big a man is,” she exclaims, examining the oversized shirt she is swaddled in, “So big, it scares him. He puts his shirt on so he won’t scare.” Here is an America so isolated, so infantilised – the way Jake and Beth regress to their childhoods while trapped in the care of their families at home – that it has forgotten how to grow up, children and parents alike. This production directed by James Hillier, however, feels like an America on steroids. A flannel-wearing, gun-slinging, stag-head-mounting America – all the things which do, indeed, happen in America – but so exaggerated it feels like America in high definition and with a high frame rate. The ensemble’s accent work is, quite literally, all over the American map, from the deep South to upstate New York, which made any reference to Montana incredibly jarring, especially because it is Shepard’s specificity of place that heightens the blackly comic and deeply surreal touches to his otherwise naturalistic drama. Very little in the split-level set or the production’s costumes feels lived-in, the sort of broken-in-ness in clothes and shoes that one would get in rough, snowy terrain, and many of the cast members handle their rifles with the carelessness of those who have never handled guns (including handing it to others upside down, with barrels pointed in all sorts of fatal directions). Despite this bleached facsimile of America, Hillier has a strong grasp of the both the humour and bleakness of the dialogue itself. It’s in the plotting of this dramatic tension that the direction and the ensemble shine, and even at a daunting 140 minutes (165-ish if you count the interval), they keep up the pace, the pathos and the comic timing. I loved the absorbing, precise exchanges between Stahl and Crane that channel both the affection and resentment that percolate in a long, difficult marriage, one between a brusque patriarch and his long-suffering, mediating wife. The rest of the cast isn’t as surefooted, with some managing to be utterly compelling in one scene and completely baffling in the next. Beth, in particular, doesn’t sound like her recovering brain is struggling to produce or process any of the words she is shaping with her mind or her mouth, instead relying on an affected, shallow whimsy. But, as an ensemble, there’s a determination to pad out these lower points and the lack of a cultural context with camaraderie and sheer will. And, in a way, this strangely exoticised portrayal of working-class white America is fascinating in terms of what it overlooks and what it emphasises. The theatrical America is, ultimately, a study of what filters across the Atlantic and how the mythos of 20th-century America is both dismantled and perpetuated. There’s a wonderful image that captures this contradiction, where a dishevelled Jake stumbles into the spotlight in a wifebeater, boxers, an aviator shearling jacket, and the Stars and Stripes draped Superman-style around his shoulders. He’s both a child and a man, a disabused abuser, an inadvertent symbol of America. He’s both the truth and the lie he tells himself. A Lie of the Mind is on until 27th May 2017 at the Southwark Playhouse. Click here for more details.